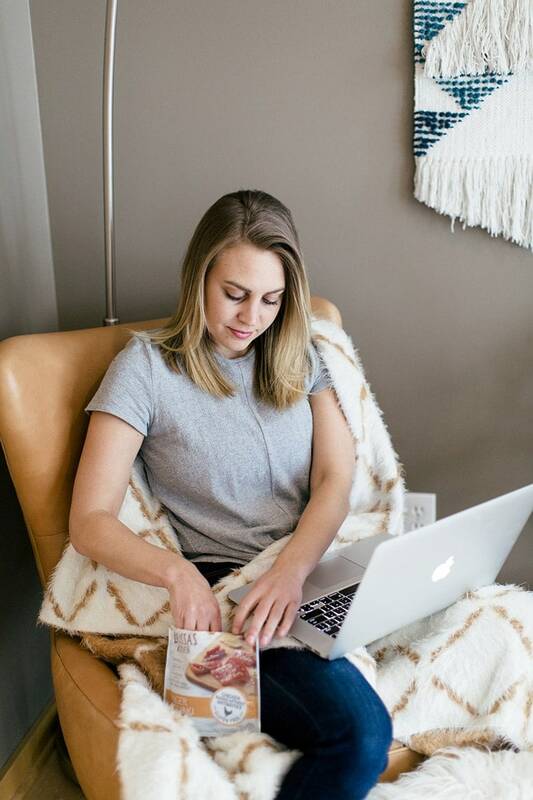 I’ve wanted to write a day in the life post for so long because TBH, I love when other bloggers do! I find it fascinating how everyone’s habits, work, eats, and free time are spent. 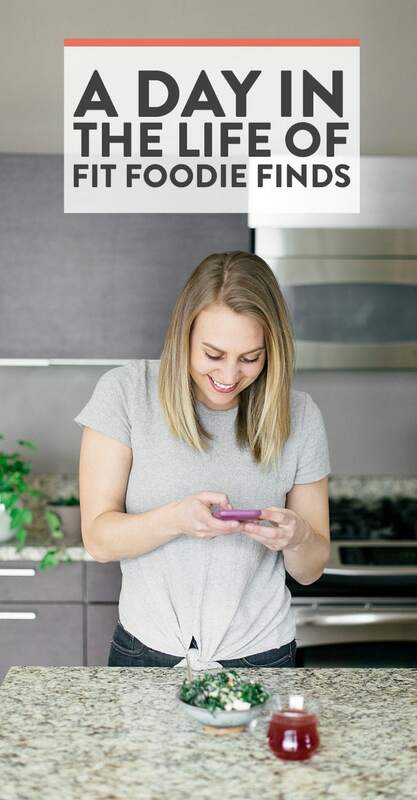 Today I am partnering with Lorissa’s Kitchen to bring you this fun look inside Fit Foodie HQ on a typical day. I say typical, but really, every day is different! It might always look like we’re having fun and games in the kitchen on the daily, but we really only do this about 2 days a week, the other 3-6 (yes sometimes I work 7 days a week) are spent taking meetings, having calls, writing emails, editing photos, storyboarding, etc! 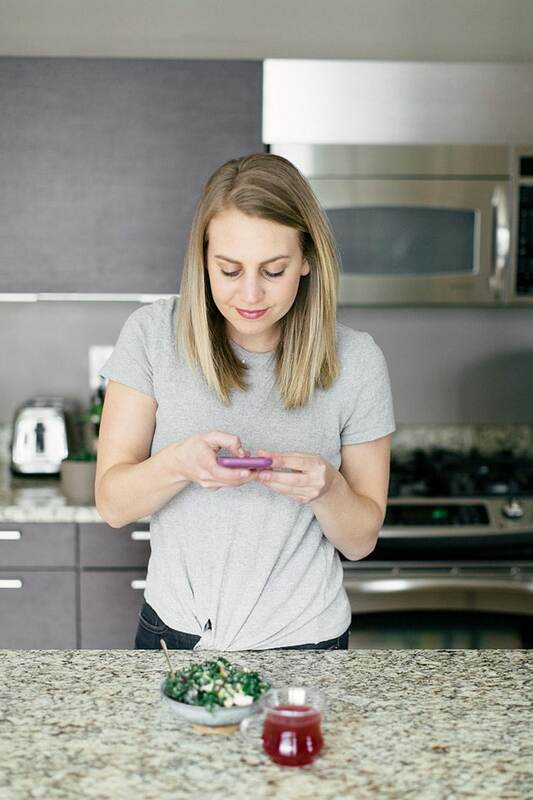 Without further adieu, here’s a day in the life at Fit Foodie HQ! Ask anyone, I’m obsessed with breakfast. Alarms are not needed to get me out of bed, just a big bowl of overnight oats and coffee. I do set an alarm every day (usually at 6:15 AM), but I’m a morning person and my body wakes me up about 2 minutes before then every day. Once I’m up and at it, I immediately hit the fridge for some oatmeal that I put together the night before. This leaves no excuses for 1. healthy eating and 2. eating in general. I’ve never had this problem, but some people can’t seem to fit breakfast in. Lately, we’ve been really mixing up our workouts, which I love! Team Fit Foodie made a resolution this year to challenge ourselves to get outside of our comfort zones and add variety to our workout regime. This includes hitting up new studios (ie: Switch Minneapolis, FlyFeet Running, Yoga Fit NE, and Tarana) and more at home workouts from Fit Foodie Finds and Healthy Glow! Linley and I actually just did an LK Total Body Bootcamp workout from Healthy Glow Co. this week! I love these workouts because they’re easy to take anywhere, they’re full body, and super challenging. After our workout, we typically come home for a quick shower and we’re ready to start the day! Like I stated above, every day is different for Team Fit Foodie, but the majority of the time we’re actually working on our computers. Linley and I LOVE Minneapolis coffee shops because not only are we coffee snobs, but it gives us an excuse to put real clothes on and to go outside. This may not sound like a big deal, but it is for us. There’s also something about the coffee shop atmosphere that just helps me GSD and be productive. 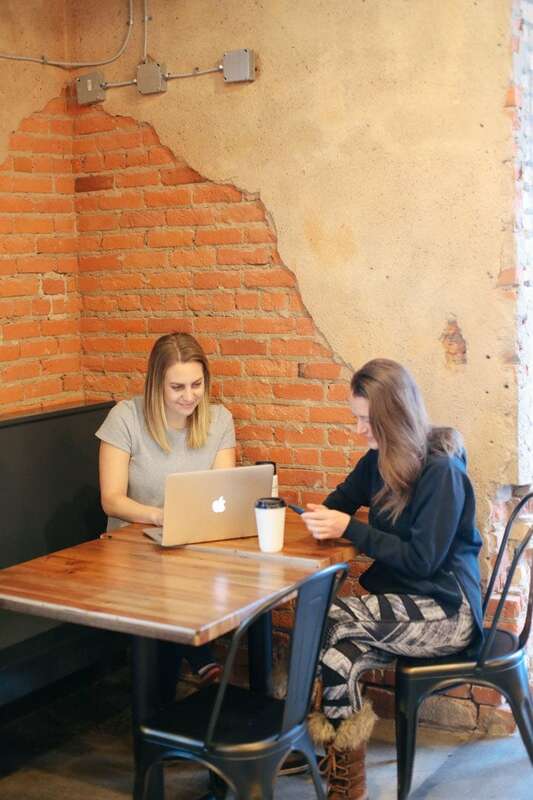 This week we worked at FiveWatt Coffee in Northeast Minneapolis. If you haven’t been, it’s attached to one of my favorite breweries, Headflyer. I always make sure to pack my bag full of snacks, one of which is ALWAYS Lorissa’s Kitchen meat snacks. I literally don’t leave my house without a couple of bags because you never know when you’re going to get hungry. For some reason, most coffee shops don’t have a lot of healthy snack options in them, so I always come prepared. 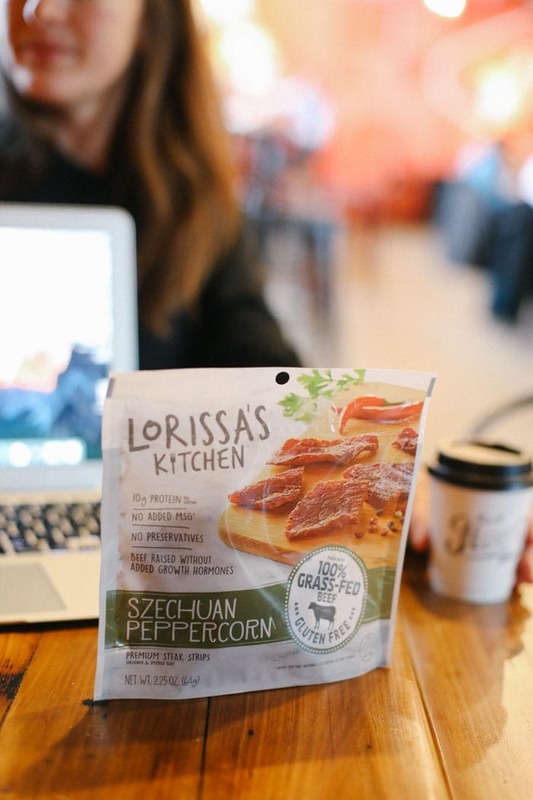 Lately, I’ve been loving Lorissa’s Kitchen’s Szechuan Peppercorn 100% Grass Fed Beef Steak Strips. Just a bag of goodness! 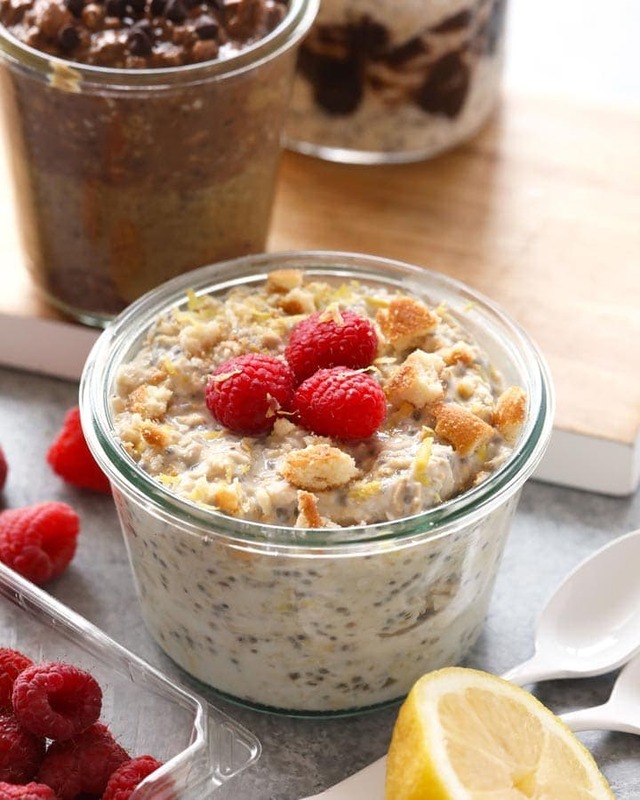 In each serving, you’ll get 9-11g of protein, which is exactly what I need mid-morning after a workout. This snack is also lower in sugar and the flavor is on point. 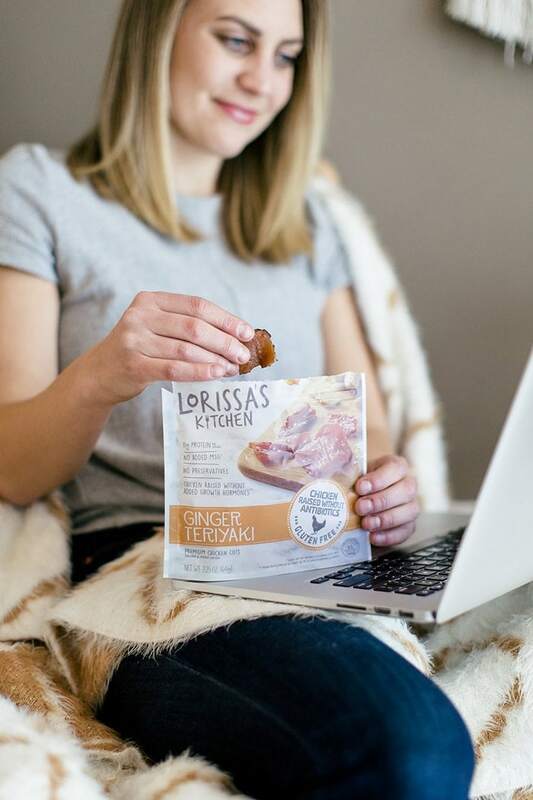 Lucky for me, my early morning sweet craving turns savory by snack time, so Lorissa’s Kitchen really hits the spot. I also love that Lorissa’s Kitchen was founded by a woman. 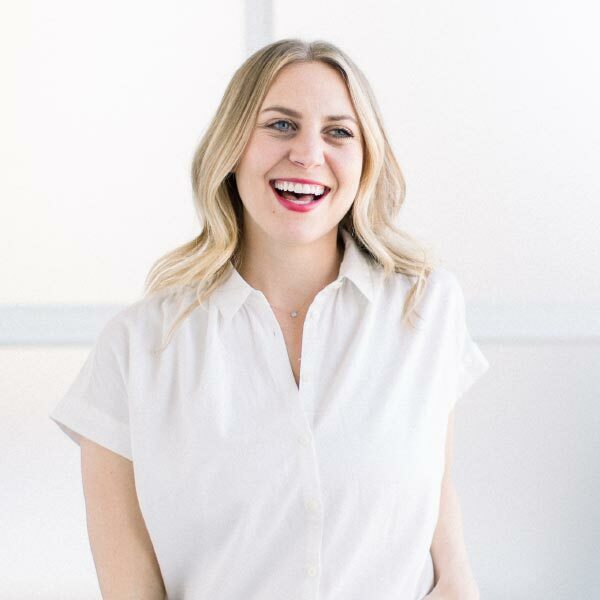 Woman-made products fueling women is what this entrepreneur is all about. AND, if it’s made in Minnesota, even better! When I worked a corporate job, I would eat lunch at like 11:30 AM on the dot. I didn’t do this because I was starving, it was mostly out of boredom and to make the time pass faster. These days, I’m much more intuitive with my hunger cues. We’ve been eating well after noon over the past couple of months and I think a lot of it has to do with the high-protein snack we eat after breakfast (cough cough Lorissa’s Kitchen). Most of the time lunch consists of Fit Foodie recipe remnants. We test every recipe at least twice so we’ve always got food in the fridge. This week we tested a kale Waldorf chicken salad (coming soon!) for the first time, so that’s what we ate all week for lunch. I paired it with some chips and Kombucha mixed with 100% pomegranate juice, which has also been an everyday thing. After lunch, we head back to the Fit Foodie HQ to continue our work day. We take about a half hour lunch break and then we’re back to work. The change of scenery from a coffee shop to my home helps me re-focus and get in the groove. I do have a desk at my house, but I work all over the place. Sometimes I’m on my couch, at the kitchen table, in the office, or in my favorite chair! I like creating little nooks of inspiration in my home filled with geometric shapes and greenery. For some reason, it makes working from home a lot more enjoyable. The afternoon is my go time when I take a lot of calls and button things up in my inbox. I’d be lying if I told you I sat for 3 hours straight in the afternoon because there is definitely an occasional dance break or IG story rant about intuitive eating or workout guilt! By 3:00 PM I am either ready for a nap or for an afternoon pick-me-up. I’d be lying if I told you that I only eat Lorissa’s Kitchen once a day because often times it’s twice! I know the serving says 3 on the bag, but sometimes I either eat the whole thing or half! I’ve also been enjoying the Ginger Teriyaki Chicken flavor. It’s a lot lighter and there’s a hint of sweetness which I love. If I’m feeling really schnazzy, I’ll make some charcuterie and pair my Lorissa’s Kitchen with some cheese, crackers, and fruit. It all depends on the day. By 6:00 PM I’m ready to wrap up my work. At least I try. Sometimes I find myself so deep in what I’m doing that it’s way past 6:00 and I’m starving, but I’m working on turning things off once 6:00 PM hits. Mark and I are very fortunate to always have a full fridge, so usually, dinner is like lunch and consists of leftovers from Fit Foodie recipe testing. We try to eat at home as much as we can, but find ourselves walking to our neighborhood pizza or sushi place around once or twice a week. This week I was on week 4 of the HGG Reset and I had modified a recipe turning a soup into a pasta. Hey, I was craving pasta and couldn’t turn down rigatoni. I ended up making a delicious turkey meat sauce with tons of sauteed veggies such as green pepper, peas, and onion. It was FANTASTIC and I might even turn it into a Fit Foodie recipe sometime soon! 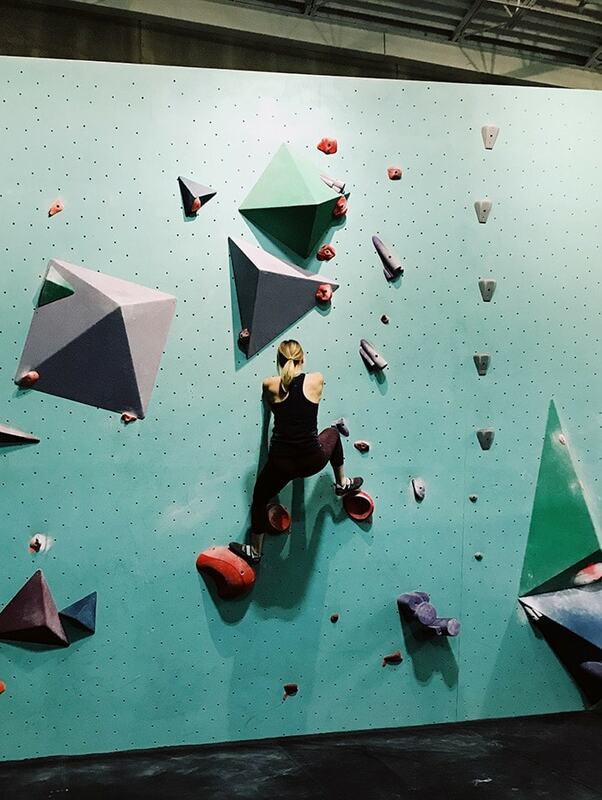 If you follow Team Fit Foodie on Instagram stories, then you know we are officially obsessed with the Minneapolis Bouldering Project, a new bouldering gym in town! Actually, you’re looking at their newest members as of a few months ago! The MBP is such a great nightcap after a long day of work on our computers. It’s not only something active to do at night, but it’s also social. We’ve got a whole gang of people that we climb with now and it’s really the greatest. I feel like bouldering really gets me outside of my comfort zone because guys, this is climbing without ropes! If you think you can’t make it to the top, you can! You just need to trust in yourself because it’s all in your head. PS: we’re actually hosting an event with Lorissa’s Kitchen at MBP in a few weeks so Minneapolis friends, keep an eye out! I almost always take a hot bath after climbing at Minneapolis Bouldering Project to take my energy down a notch. I fill my bath with hot water and add in some Epsom salt and light a few candles. 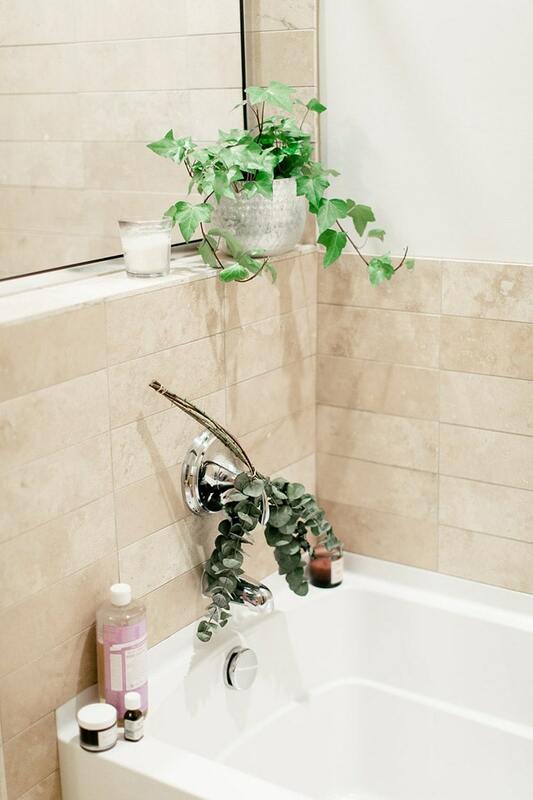 I picked up a bundle of fresh eucalyptus from Whole Foods that I like to tie around my faucet. Pro tip- close your bathroom door so you can steam your bathroom up a bit to really get the aroma going. It works a lot better in the shower, but it’s easily transferable. I’ve been loving a few different bath products lately such as: Dr. Teal’s Epsom Salt, Dr. Bronners Castile Soap, and coconut sugar scrub. Post bath, I hit up my freezer for one of my famous peanut butter cups. Can you say best nightcap ever? 9:45 PM Time for Bed! By 9:45 – 10:00 PM I am totally ready for bed. My goal is to be in bed by 9:40ish and asleep by 10. I’ve always been an early to bed kind of person and would probably go to bed even earlier if Mark and I didn’t live together! I value my sleep and am totally a 9-hours kind of person. I’ve attempted the whole 7 hours of sleep or less thing and it just doesn’t work for me. Before bed I like to spray some lavender essential oil mist on my pillow and get comfy. If you’re wondering, I sleep with my socks OFF and my white noise machine ON. If you don’t have a noise machine, it’s been a lifesaver over the last year. Mark got me one for Christmas last year and I can’t fall asleep without it now! I am such a light sleeper and suffer from insomnia pretty bad sometimes, so a noisemaker is a game changer. Okay so, want to know what happens once I get in bed? I lay there and scream “MARKYYYY” until he comes into the room to snuggle. He’d stay up until like 11 or 12 if we didn’t live together. However, I love our nighttime chats and giggles so he takes one for the team and comes to bed early sometimes. It’s for sure the best part of my day. 10 minutes later I tell Alexa to turn the lights out and BAM I’m asleep. And there you have it, a day in the life of Fit Foodie Finds! This post is sponsored by Lorissa’s Kitchen. I was compensated and all opinions are my own. Thank you for supporting Fit Foodie Finds and for allowing this website to be possible!